An occlusal guard is a horseshoe-shaped piece of plastic which is worn over the teeth to protect them against damage caused by clenching or grinding. It works by creating a physical barrier between your upper and lower teeth so that you bite against the plastic rather than wearing down your teeth. Most people are unaware that they grind (also called bruxism) or clench their teeth, Some people may do this consciously during the day, but it is a larger problem at night while you are asleep. It is often a person’s partner who first notices that they are grinding their teeth. People tend to go through phases of grinding their teeth, such as during times of stress. 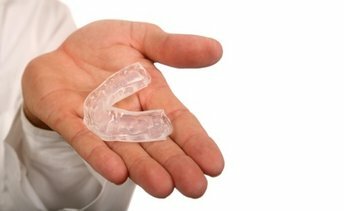 It is during these times that you may need to wear an occlusal night guard to prevent doing permanent damage to your teeth. The Night Guard Provides a barrier between your top and bottom teeth while you sleep. All Night Guards are custom fitted for comfort and to allow for proper breathing. We will take an impression of your teeth and have the Night Guard created by a dental lab. Night Guards are very durable and can be used up to 10 years.